I bought a pair of gorgeous filigree drop earrings on sale for about $5 because one of them was missing one of its dangly leaves. I didn't realise that until I got home, but even when I did realise, I didn't mind. After all, with all those lovely other dangling shiny bits, who would notice? What I did mind was the weight! After about 2 minutes of wearing them while finishing my makeup before going out, I had to take them off. They felt like they were going to rip straight through my ear! I'm sure there are many of you out there who are laughing at me, telling yourselves that I should have known better, but I didn't. I've never been one to wear big earrings, and I didn't honestly realise how long they are (around 15cm!) until I put them on and they were brushing against my shoulders. The watch really works, too! Anyway, they hung on my jewellery board for more than a year. I still loved the idea of them, but couldn't bear the thought of dealing with that weight on my poor little earlobes. 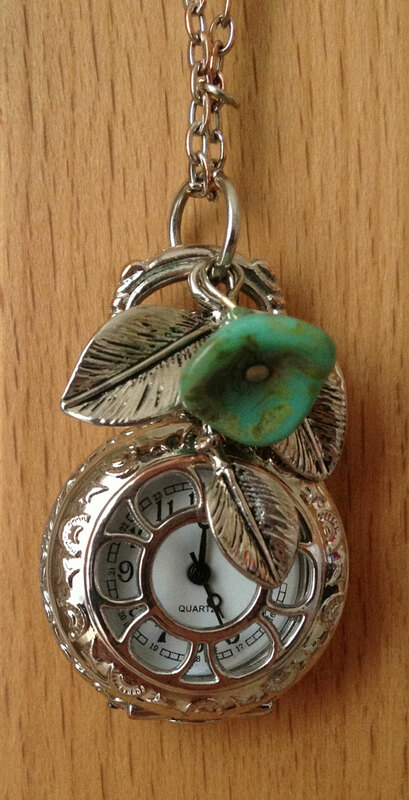 Next to them hung my everyday earrings and my favourite necklaces, until one day I picked up my favourite necklace, this watch pendant, and lamented that the leaves on the two pieces went so well together, if only the earrings were smaller and lighter. I make jewellery all the time. I can make these earrings smaller and lighter! And so, out came my trusty jewellery pliers and away I went! Step one: open up the loop underneath the pearl attached to the earring hook. Don't flatten it out completely, just open it up enough to slide it out of the hole on the big filigree piece. Next, do the same for one of the dangling bits with the chain, pearl and leaf. Then open up the ring attaching the lowermost piece of filigree. For safety's sake so it doesn't go anywhere, make sure you close that ring back up again after you've removed the filigree piece. Step two: Keep the pieces you've removed and put the rest of the earring away. It might come in handy for another piece of jewellery later. Slide the wire from the bottom of the hook piece into the hole at the top of the filigree piece, making sure the filigree piece will face forward when the loop is closed. Gently close the loop, taking care to maintain that nice smooth loop and not scratch the pearl. Then, slide the loop from the dangly piece into the same hole the leaf is attached to on the filigree piece. Close that loop too. 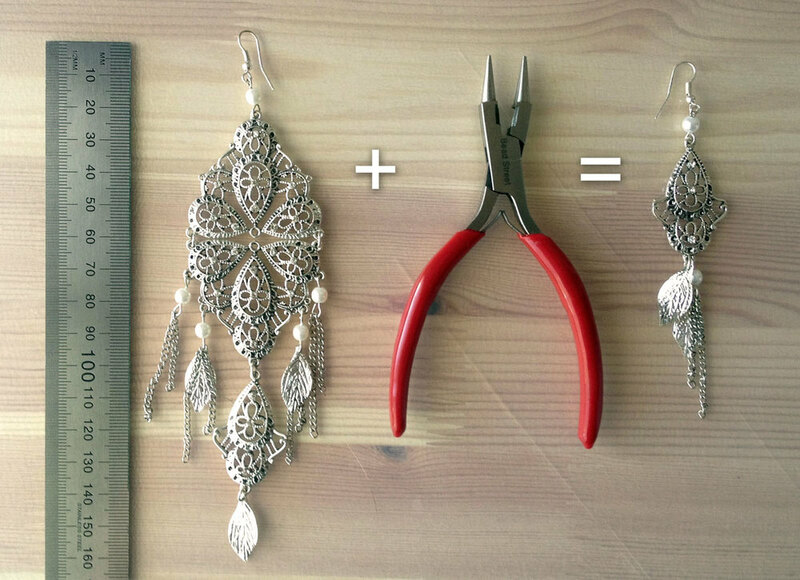 Repeat for the other earring and you're done! I'm really pleased with how these turned out. I think I've managed to retain the big and bohemian style of the earrings while losing a lot of the weight of the originals. Thanks to the dangling leaves and chains, the earrings are still long enough to make a statement (around 10cm) but no longer feel like knives stabbed through my ears. And I was right, they look great with the necklace!